Eating out is an easy, convenient route to satisfy your hunger. Yet, this miscellaneous spending category can seriously make a dent in your budget if you don’t try to limit your outings for food! Treating others to a meal I think is the most costly to your own food budget. It’s nice to be generous from time to time, but never let it get out of hand where you get nothing in return! For the past year, I have cut down on going out to eat. Making most of my meals at home from breakfast to dinners have reduced my food bill dramatically, but there are times where I long for some tasty delights that I can not concoct myself. My suggestion is try to find a balance. Setting a budget for food is great, but if you go over your limit, does that mean you’ll have to starve yourself for the rest of the month? It’s okay to go a little over budget for food since it is an essential item to keep you alive! Just make sure for the next month, you try to not repeat the same mistake again in overspending for food. On a monthly average, I spend $278.18 in total for food. I usually spend $124.40 on groceries (BF & ME) and $153.78 on miscellaneous eating out. Month to month, it does fluctuate depending on the occasion. Tonight, I decided to make The Poorman’s Meal courtesy of Clara. Poorman’s Meal consists of affordable items like onion, potatoes and wieners. I decided to add celery to make it a greener dish instead of just meat and potatoes. Seasoning: 3 spoonfuls of salsa and salt, please add some water to soften the potatoes. $3.00 for a hearty meal to satisfy two adults plus some leftovers for next day’s lunch! Everyone can make this. It’s a simple recipe and tastes just fine. There are lots of items out there that are affordable and tasty versus going the easy way out like eating out at a restaurant. Just have to find the right combination to make them work. I love surfing on YouTube for recipes and ideas. Sharing really does give others the opportunity to learn and accept for what’s being put out there. The net is a vast highway for information. Use it wisely. Last week, I went out with some friends to a Thai restaurant. We had papaya salad, stuffed chicken wings, tom yum soup, penang curry, pad thai. The portions were small. So between the four of us, we ordered double for everything except for the papaya salad and a couple of pop drinks. At Thai restaurants, they charge extra for a bowl of rice. When the bill came, it was $105.00 after taxes! We split it four ways and decided on a round number of $30 per person giving the restaurant a very nice $15 tip! Normally, I tip out 10% before tax. Since it’s a group outing, I didn’t want to cheap out as they agreed on $30 per person. That was a very expensive meal for me! And it’s not even fine dining! Yes, the food was good, but was it really worth it? So the next day, I went out for Cantonese Cafe restaurant for my mom’s early birthday dinner. It was just my parents, bf and moi. We showed up at 5pm after work to get in on their daily special menu. So between the four of us, we ordered fish maw soup, salty fish fried rice, beef vermicelli noodles, and house special fried chow mien. Three of the dishes came with a hot drink or add $1 for cold drink… I just had tea! Our bellies were full and our taste buds were satisfied. When the bill came, I was happy to see that it wasn’t going to cost me an arm and a leg. I ended up treating everyone for a grand total of $38.25 and that includes 10% tip! Moral of the story: Don’t order too much, you’ll end up spending more than you like. Don’t eat too much, you’ll get fat. Even though, I found a higher paying job a couple months ago. I didn’t automatically spend a whole bunch of money on new work clothes. Scavenging in my closet to make due for my new work attire requirement which is business casual. It’s hard after years of wearing casual tops and jeans to work for my previous work. Most of my old work pants don’t fit anymore. So far, I only added one new dress pant to my collection and a few tops. I try to minimize my spending as much as possible. Living below my means is a way of life for me and I am proud to say it out loud. Ever since I moved out from my parents, I have been eating out less and less for lunch (new job) and dinner. Over the ten months, I’ve lost a good ten pounds. You can say I lost a pound a month! Still a little extra fat on certain areas of my body that I would love to get rid of, especially my tummy! It’s a work in progress. Keeping an Eye on ConAgra Foods Inc.
Have you ever met anyone who doesn’t go grocery shopping or eat at a restaurant in some point in their lives? Everyone on this planet relies on food to survive. Food makes the world go round, just like money. For the past month, ConAgra Foods Inc. has been relatively flat. 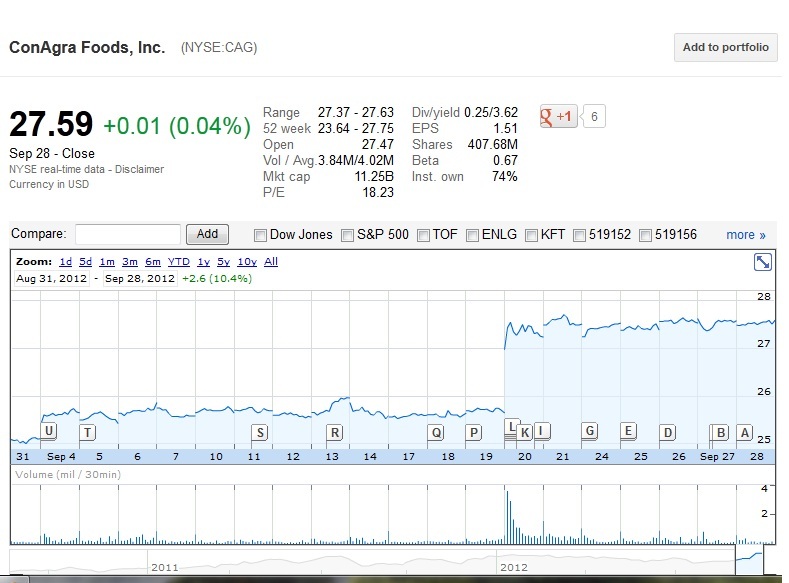 On September 20th, there was a sharp increase to their share price, jumping $2.00 to $27.59/share. Their dividend yield is at 3.62% in which they’ve been consistently paying out for the past 25 years. Is this their breakout point? Or is this their resistant point? Right now, I got a couple of grand ready to buy 100 shares. Time to fully deploy all my cash! What the hell! I track my spendings everyday. You can say that I’m good with money. I don’t spend a whole lot on silly stuff. But somehow I managed to rake up a bill of $10,000 already and still counting! Last year, I have managed to keep my spendings at $10,000. Time for me to really stick to my budget for the next few months and pay off my debts as fast as possible. One’s biggest expense is either on rent or mortgage on a monthly basis. Thank goodness, my spendings doesn’t include living costs as they are being covered by my parents for now that is. What I spend most are things associated with my car like gas ($150/mo with 30km each day to work), insurance ($1578/yr with my 40% discount), and maintenance costs. Food is a major expense too, though I try to eat at home on weeknights to cut down the bill. Going out to eat is quite costly. Fast food joints are always cheaper and tasty, but in the long run, you know you’re just putting junk in that tummy of yours. I usually scan the menu for the cheapest item. Of course, I always like the biggest bang for my buck. A good way of saving money when going out to eat is to order water instead of other drinks that usually cost $3 and up. Learn to discipline yourself with not over eating. That way, you don’t have a lighter wallet plus unecessary pounds. Having a boyfriend means more outings and finding things to do. You can’t have him always picking up the tab right? That’s not fair. Though sometimes I do envy those girls who totally milk their boyfriends. What else do I spend? Oh yes, my monthly cell phone bill, but I only pay $22.40/mo as I only use it once in a while. Reason why I even I have a cell phone is for emergencies or to meet up with people on the go. Most days I’m at the office or at home. I can always be reached at another number. I haven’t spent that much on clothes this year, though I bought my bridesmaid dress for a couple of bills. Gifts and donations ($200) are a great way to totally blow your budget. They come in birthdays, Christmas, weddings, and countless of little things you feel obligated to chip in as well. Yearly vacations are to rejuvenate your soul. A few days away from work is like a haven for most. They do come at a cost though. Relatively short vacations to Cancun and San Fransico for me rang a bill of $2000. Electronics, luckily I am not really a gadget person who always want the latest technology. Though, I recently I bought a laptop for $560. The old laptop I had was just not efficient anymore, I managed to sell it for $110 to a willing buyer! Unexpected bills can pop up and hit you where it hurts. This year I had a fitting for my crown tooth. An old cavity fill fell out. It was a big fill on the side of my tooth and I had left it unattended for ages. My dentist told me my tooth was starting to decay. I got a crown for my tooth which my dental plan covered 50%. I ended up forking out $420 still. Dentists are such rip offs. Gambling, opened a Pokerstar account with $100 plus a stupid cash advance fee on the credit card of $5 and interest. Dad depleted it. What a waste of money. It’s easy to spend than to save money. I’m a saver at heart. You can call me thrifty, but I am not cheap. I have a giving heart depending on the situation. Don’t you just hate people whose mentality is to take whatever they can get! All they think is for themselves with little disregard for anyone else. Have you ever met a coworker, friend, family member whose a leecher? One who always skimps out on the tab when every forks out to pay at the end of a meal. One who always hitch a ride with you, but never offering to drive you for once. One who just shows up empty-handed for a potluck. My point here is that it’s okay to be good with your money, but don’t always be the cheapstake.